WASHINGTON, DC – In a major blow to the Donald Trump presidency, Nikki Haley, the highest-ranking Indian-American in the administration, has abruptly announced her resignation as US ambassador to the United Nations. She will step down from her post at the end of the year. Seen as a stabilizing influence in a tumultuous administration, the news has come as a surprise to many in the foreign policy community and beyond who hold her in high esteem. The president himself professes a unique regard for her. Trump disclosed that he knew about her decision “to take a little time off” at the end of the year. “She told me probably six months ago,” he informed reporters. On appointing a successor, he said, “We have a number of people that would very much like to” serve as the US envoy to the world body. “I would say we’ll name a successor within the next two to three weeks, maybe sooner,” he divulged, after consulting Haley, his chief of staff General Kelly and other While House officials. Haley is a trailblazer – she is the first female and first minority Governor of South Carolina, and she was re-elected to the position for a second term in 2014. When President Trump entered the White House, she became the first-ever Indian American to hold a cabinet-level post. With her departure, senior ranks in the administration will feature even fewer women and minorities. About her departure, she said, “I’m not leaving until the end of the year. My goal is that we make sure everything is in good place for the next ambassador to come in.” She was non-committal on any future position and gave no plausible reason for her resignation. 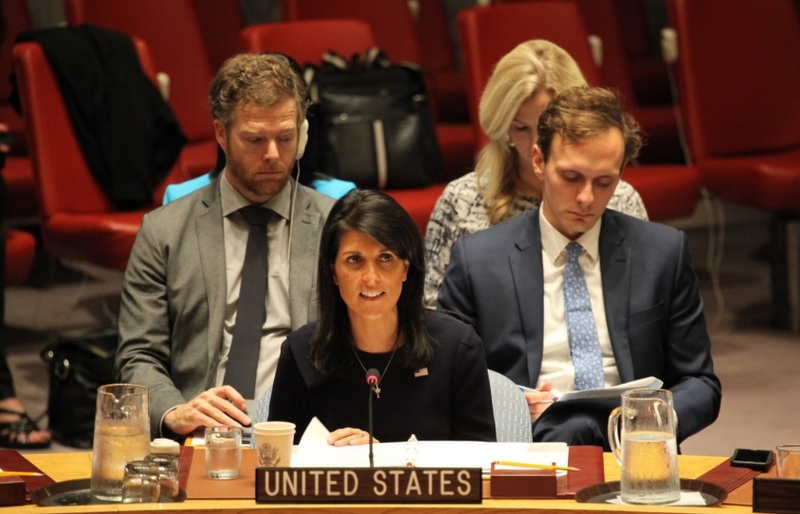 “It was a blessing to go into the UN with body armor every day,” Haley said about her work which entailed defending America on the world stage. She sounded upbeat and excited about America’s position on the world stage. “Look at what has happened in two years with the United States on foreign policy. Now, the United States is respected,” she affirmed. “Countries may not like what we do, but they respect what we do. They know that if we say we’re going to do something, we follow it through. And the President proved that”, she said mentioning stern warnings against the use of chemical weapons in Syria, the NATO alliance and other countries paying their share, and new trade deals. “They get that the president means business, and they follow through with that,” she added. At the press conference, Haley enthused, “I can’t say enough good things about Jared (Kushner) and Ivanka. Jared is such a hidden genius that no one understands,” she said citing the re-done NAFTA deal and the Middle East Peace Plan. To her credit, Haley, long seen as a rising GOP star, is making her departure from the Trump administration with dignity and respect in tact.